In "Photoshop to HTML", Nettuts editor Jeffrey Way takes you through the entire process of converting a design from Photoshop into a complete HTML/CSS website! But this is NOT just an eBook. It also comes packed with extras! 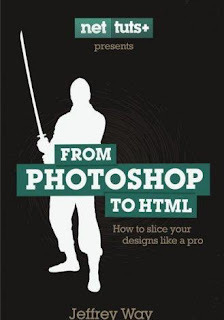 You also get a directory of Photoshop, HTML and CSS files for you to use as you work through the book AND a series of 14 screencasts covering the whole project from beginning to end. * Different methods for slicing a PSD. * Create semantic mark-up, and learn how this HTML relates to the original PSD. * How to utilize techniques, such as background replacement and sprite generation. * Use custom fonts with Cufon font replacement. * The differences between absolute and relative positioning. * How to compensate for the dreaded Internet Explorer 6. * Take advantage of advanced CSS3 features. * How to take advantage of a variety of helpful browser extensions to expedite your coding. * Utilize the jQuery library to add a touch of interactivity.